We caught a glimpse recently of Rina Whyte’s artist notebooks where she explored ideas for her newest works, “I am Peacock I” and “I am Peacock II”. These notebooks are exquisite artworks in their own right, full of colour and texture. 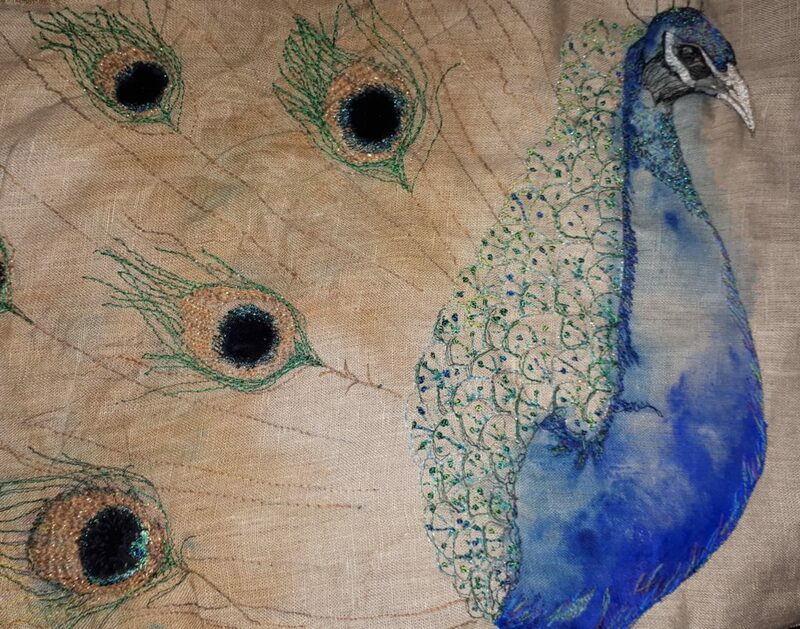 Rina uses watercolours, colour pencils, collage, tissue and scraps of fabric to work through her ideas for these glorious peacocks, refining shapes and colours tones, exploring minute details to the fullest. 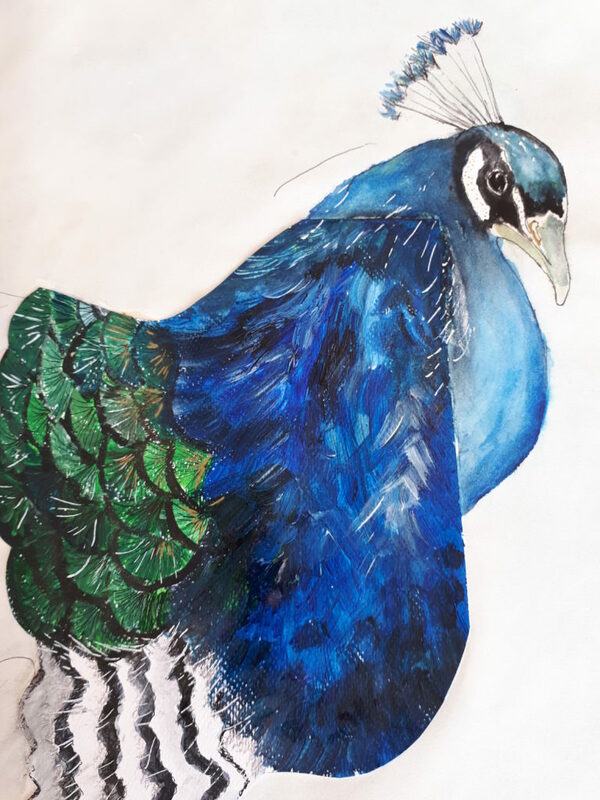 Inspiration is not difficult to find for Rina as peacocks are kept in her local area and when she sees them in her garden she runs for a camera and sketchpad to capture their elegance and beauty. 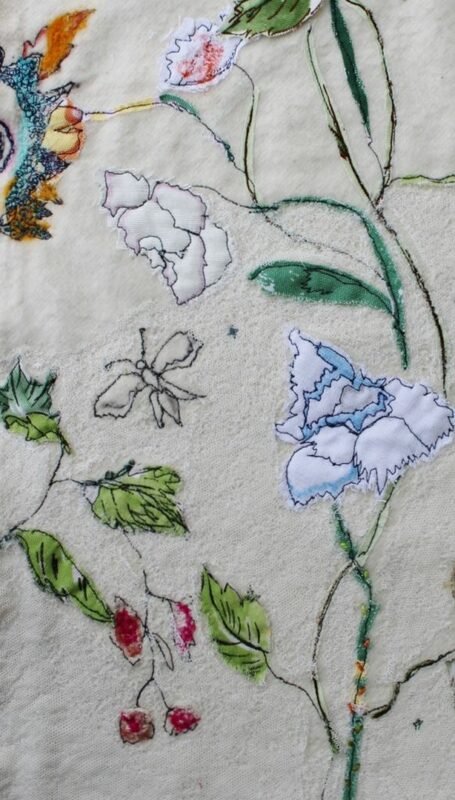 Rina’s work incorporates both hand and machine stitch and sometimes uses existing decorative fabrics which she embellishes with stitch, beads and applique. 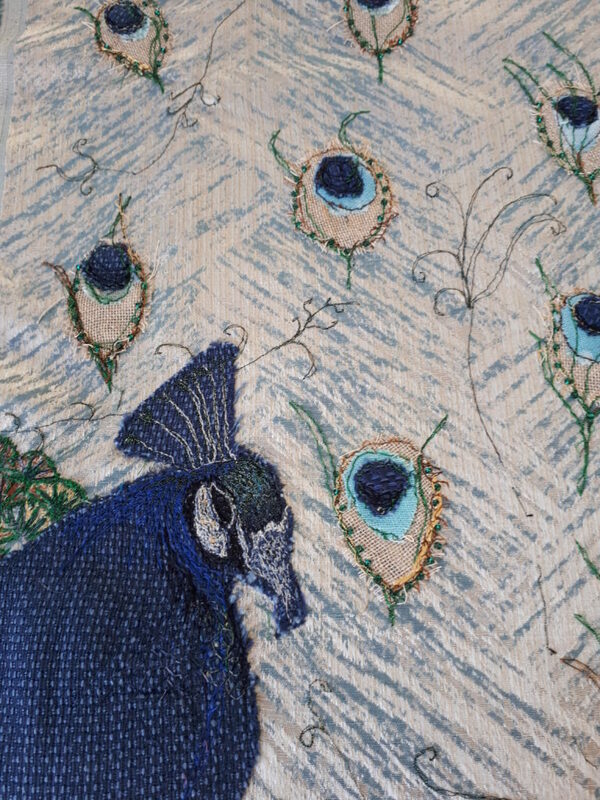 Rina also uses tea dyeing and bleach to distress the ground fabric before incorporating paint, found fabrics, metallic threads, sequins and beads to create the design. 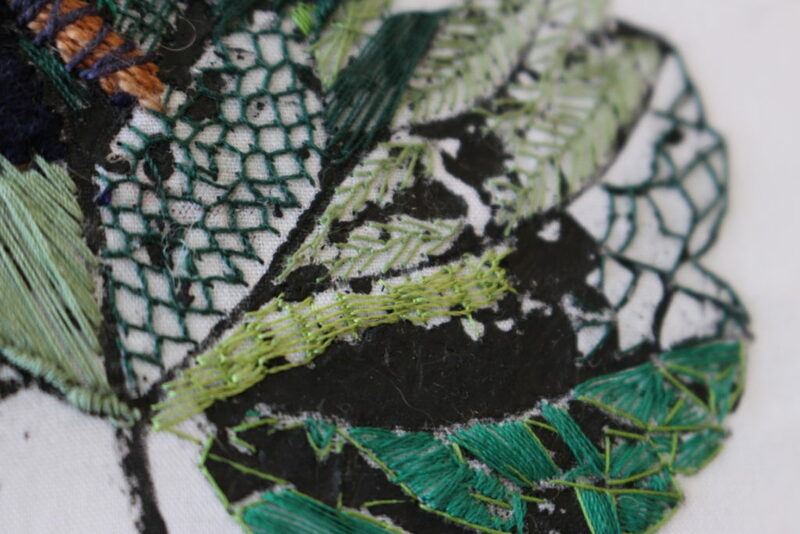 Double layers of yarn are used to create texture and depth of colour whilst still retaining the delicate stitch drawing. Some of us have been travelling ….. Australia…..India……and more. Some of us have started studying again ….. National College of Art and Design….. Crawford College of Art and Design….. 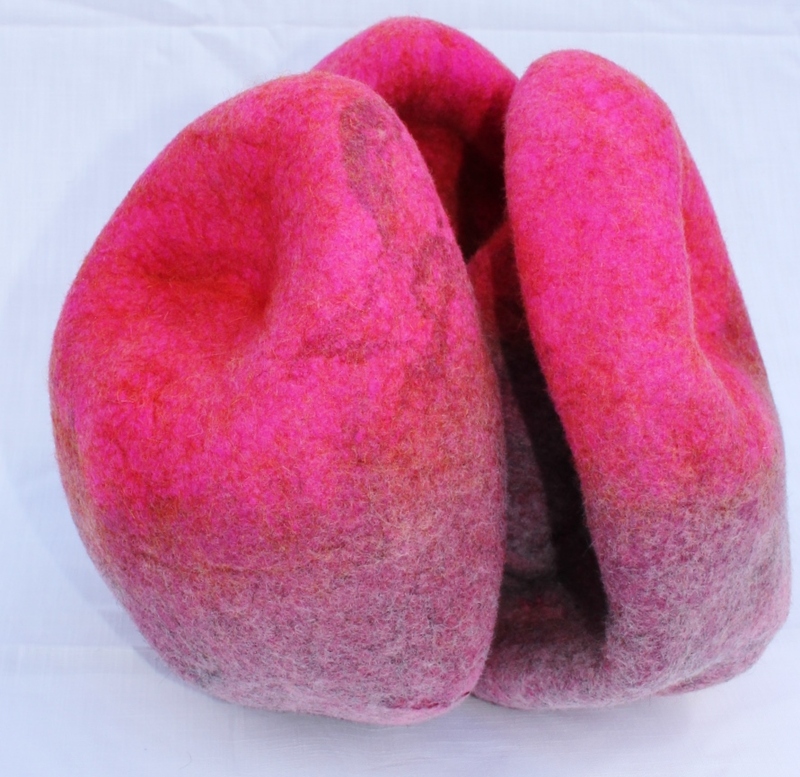 Some of us have given workshops….. felt hat making……. Some of us have been ill…..
and most importantly of all, most of us are still creating, learning, sharing and looking forward to a productive 2019! We are having a planning sessions this week to work towards our next big project. Just a quick reminder of our current work on display in Las Rada Wine and Tapas Bar, New Row, Naas. There is definitely mellow autumn tones to the work – and a sense of loss at the fading of the summer just gone. 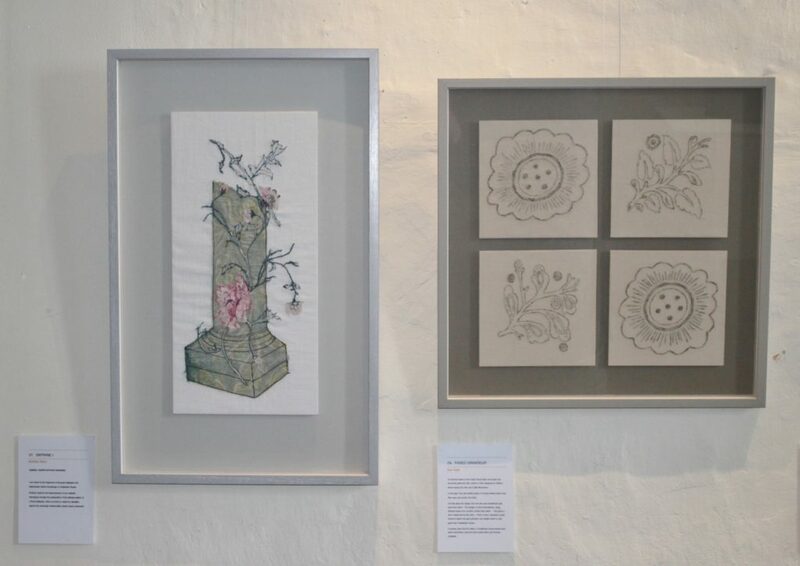 A series of pieces incorporating print and hand embroidery by Hannaleena Ahonen. 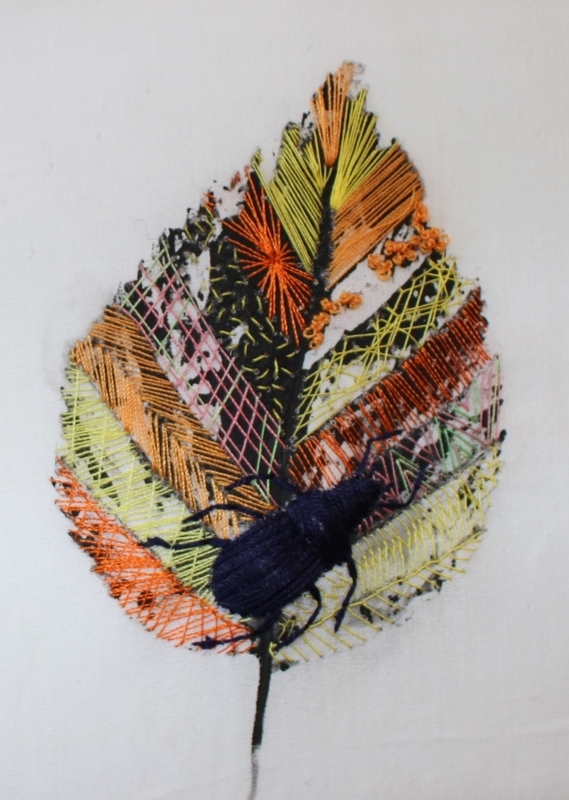 Her work celebrates the wonderful summer just ending and the abundance of insects busy doing their jobs into the autumn. Dee Kelly was trying to preserve some of the fading beauty from her garden in this piece entitled ‘Summer’s End’. 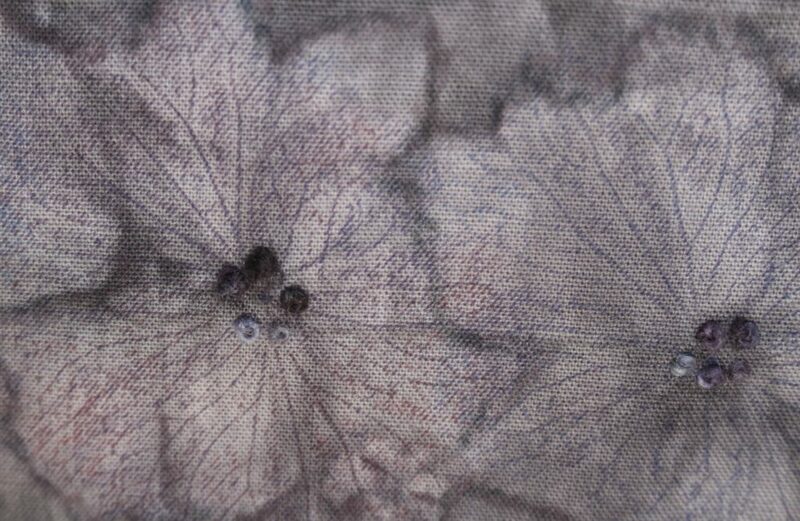 She eco-dyed some cotton with peony leaves and over printed with hydrangea petals, using charcoal pencils and hand stitch to complete. 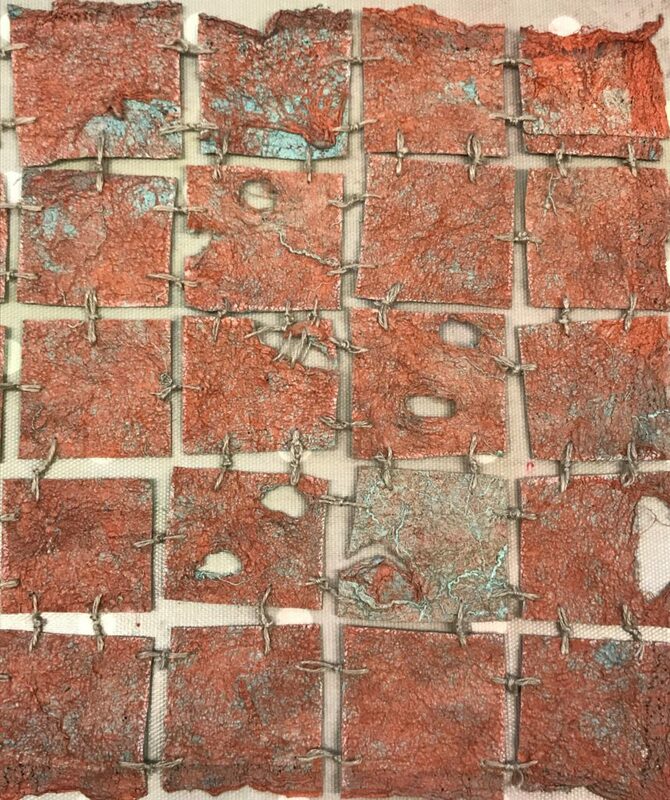 Pauline Kiernan was just about ‘Keeping It Together’ with this piece exploring the idea of loss and fragility. She used Korean hand made paper, felted, distressed and hand stitched. 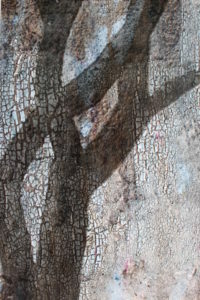 Tree bark from the beautiful ‘Prunus Serrula’ forms the basis of Kathrina Hughes work called ‘Bark Cloth’. 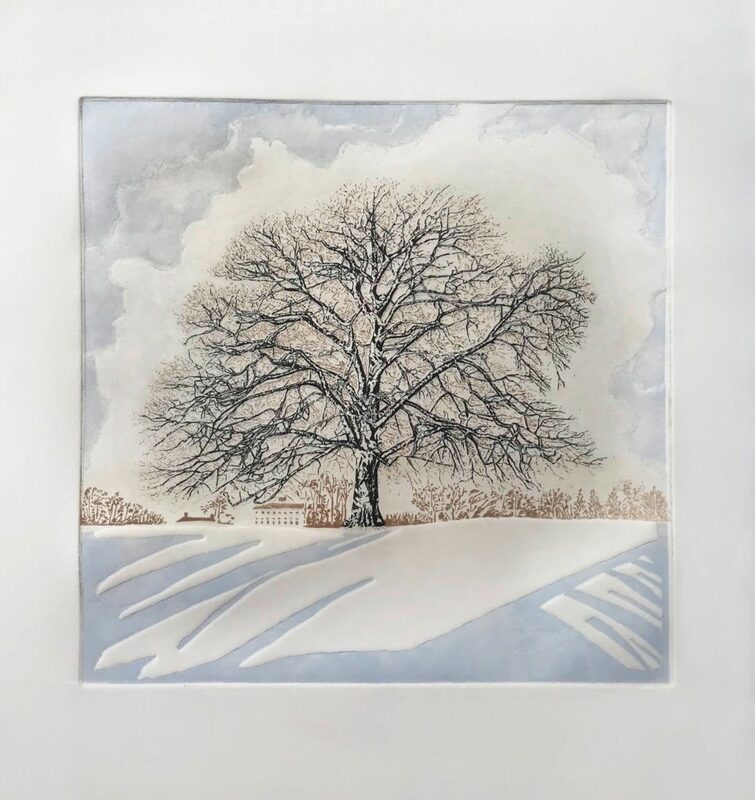 There are many more beautiful pieces in the exhibition so pop in to Las Rada for a quick viewing and something nice to eat! Craft Fair – its not too early to order gifts for Christmas!! 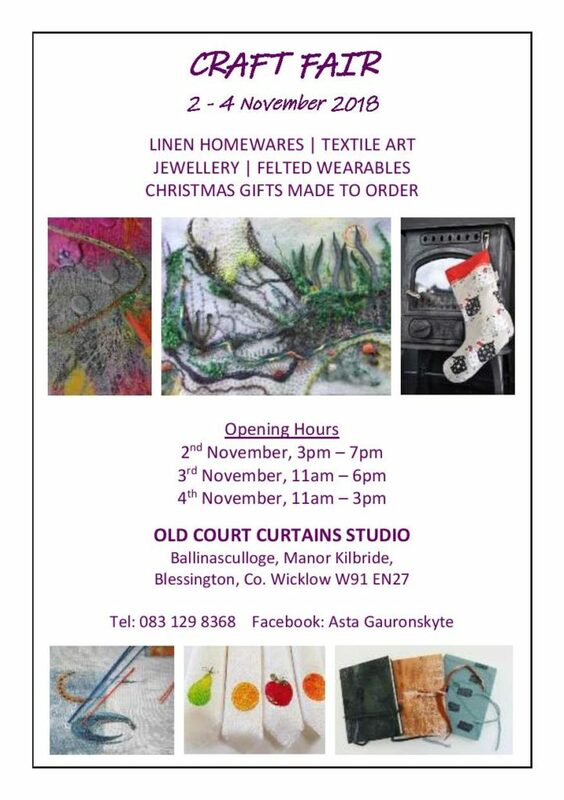 Asta has asked us to let you know about the Craft Fair she is hosting at her studio next weekend. It is running from 2nd – 4th November – full details of times are below. 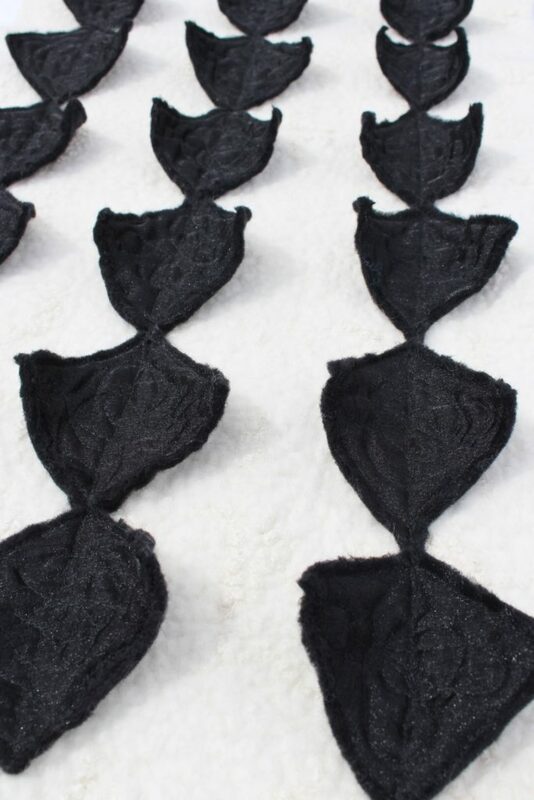 There will be lots of items suitable as Christmas gifts – linen aprons, oven gloves, tablecloths, Christmas stockings, cushions, Christmas wreaths, felted scarfs, slippers, hats, wall hangings and small mixed media pieces. Orders can be taken for most items. Asta will have the kettle on and the coffee pot warming to welcome you. You get the added advantage of a scenic drive to a beautiful country location on these bright sunny days. 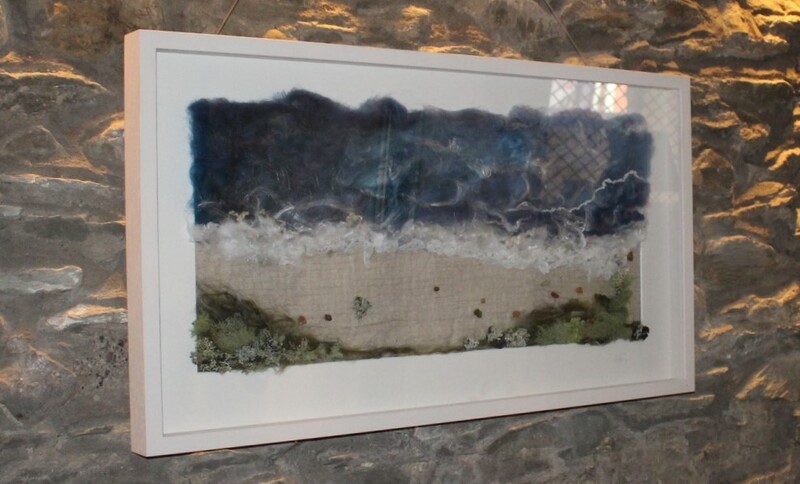 We are coming to the end of our exhibition in Castletown House – Wednesday 22nd is the last day. 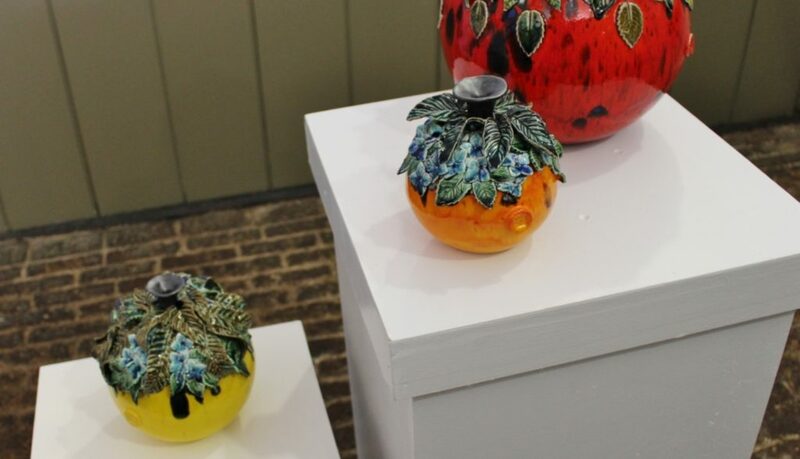 We just want to say a very special thank you to everyone who visited the exhibition, gave us such wonderful feedback and, of course, purchased our work. 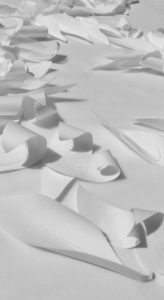 Some of the work from this exhibition is moving to Inniscarra Gallery in Rathcoole with the kind permission of Niamh Harney, so you will get an opportunity to see an edited version at the gallery for some weeks to come.